An ongoing learning programme can be quite beneficial to your organisation if executed and managed effectively. It was the poet Alexander Pope who famously said, “a little learning is a dangerous thing”. Today many organisations are finding that, conversely, a lot of learning and training can be a dangerous thing. This is because our ever expanding digital libraries of learning and training assets can quickly become rather messy if they are not managed, filed and harnessed in the right way. Imagine your local library after a day in which a few classes of excitable school children have had fun rummaging through various bookshelves on the hunt for a book to borrow - and now multiply the ensuing mess by a factor of 1,000 and you get the picture! Fortunately there are a number of things that can be done to avoid any nasty organisational headaches emanating from a chaotic approach towards learning and training assets. Here are five suggestions that will help you to supercharge your training and learning function this year. In the good old days, organisations stored their learning materials in just one or two tools – often an internal folder system supplemented by an LMS. Today this model is creaking at the seams. There are so many kinds of learning happening, and so many places where learning content is stored, that keeping on top of it can feel a little like wrestling with a digital monster. Leaving aside the commodity, licensed content accessed via third parties’ systems, a proliferation of in-house learning content is seeping onto a range of disparate systems, including video portals, LMS, intranets and any number of other internal systems. One way to address this is by converging several systems – for example, HRIS, HCM, and LRS systems; another approach is to use one of a range of new products coming onto the market that aggregate siloed learning experiences so that they are discoverable across multiple systems. The added benefit of converging or aggregating learning content is that it makes it easier to look for trends in the data, which can be used to inform future learning engagement. A growing number of organsations are using a LRS to collect data from learning content and then analyzing this data to model future outcomes. It is also possible to model how to change those outcomes. Take the example of a construction firm. By analyzing data pertaining to each employee – for example qualifications, number of hours’ training undertaken, and key personality traits - it is possible to predict their likelihood of being involved in an industrial accident, and to model what further training needs to be put in place to reduce this risk. We’re all familiar with the applicability of VR technologies for teaching very precise skills, such as how to build or fix a motor. But VR is also useful for teaching soft skills such as customer empathy and understanding. Lack of empathy from customer-facing staff is a major headache for organisations. Who can forget the doctor who got dragged off the United Airlines flight - and the bad press that ensued? VR-based soft skills training lets staff immerse themselves in a 360-degree virtual world, practise appropriate responses, and learn from their mistakes. It’s this complete immersion that adds an extra dimension when compared to traditional classroom/role play training. Consider a busy hospitality scenario, for example, where staff need to learn to make quick decisions on who needs help, and how to prioritise who to help first. Using VR, they get to scan a busy room as if they were really there. This helps them to learn what pointers to look for in the pursuit of excellent customer service. The time and money involved in developing multimedia learning content makes it sensible to repurpose as many of these assets as possible for additional external uses. Oracle, for example, created a wealth of video assets for internal sales team product training, and then realized that it could easily repurpose the content for use by external audiences too. The content has been repurposed and made available to Oracle resellers via a reseller portal, and also to customers via a self-help portal. A customer-facing self-help video portal is especially interesting as it can be used at all levels of the customer lifecycle. Not only can customers learn how to use a firm’s products, this approach also helps to reduce call centre costs and improve the customer experience because customers can resolve some of the problems themselves. Plus if they do give up and call the help desk, staff can instantly see via their dashboard what the customer has already tried – saving the firm money, and increasing customer satisfaction too. Training is no longer a case of pass or fail but rather an ongoing activity. Increasingly, training is integrated into operational systems, and a feedback loop ensures that employees are maintaining the required standards and flags up any problem areas. This is especially important for individuals who spend the majority of their time out on customer visits – for example, washing machine engineers. With a feedback loop established, the organisation will automatically receive data from the employee’s mobile device after every job, covering aspects such as customer satisfaction rating, whether the engineer had to consult additional resources for help, and how quickly he fixed the problem. Probably the best approach is to start by reflecting on where you are today and what changes to existing systems and approaches can reasonably be made in a given timeframe. 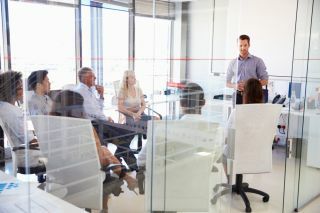 By getting stakeholders’ buy-in to a plan, based on the adoption of some of the suggestions above, it is possible to minimise some of the administrative overheads associated with running and managing company-wide learning programmes, while also boosting learning engagement and outcomes. Which has to be a win-win for everyone involved. And proof that a lot of learning doesn’t need to be a dangerous thing after all!